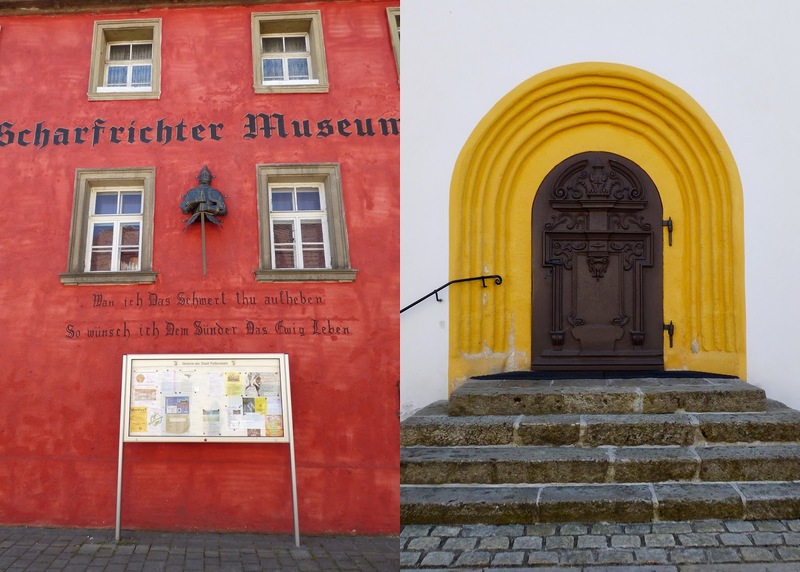 We had never been to the nearby fun-filled town of Pottenstein so that was our destination. 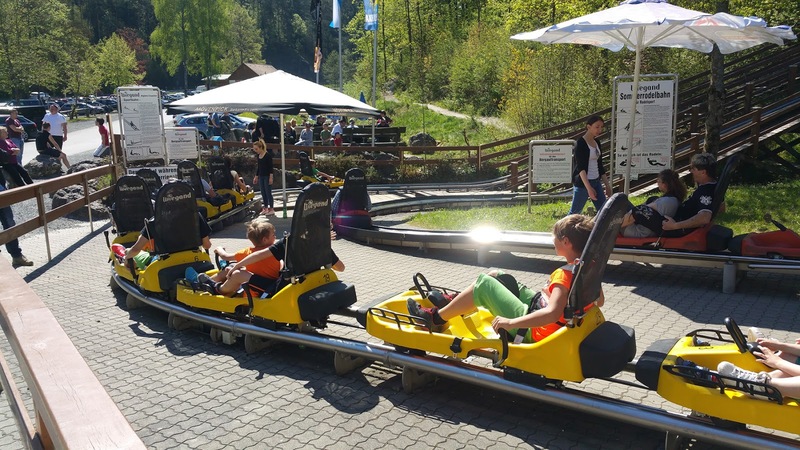 Located in Franconian Switzerland, Bavaria, it has all sorts of mountain fun, including an alpine slide and caves and paddling on a lake. Over here they call alpine slides "sommerrodelbahn". Fox and Chris ready to have the time of their lives. 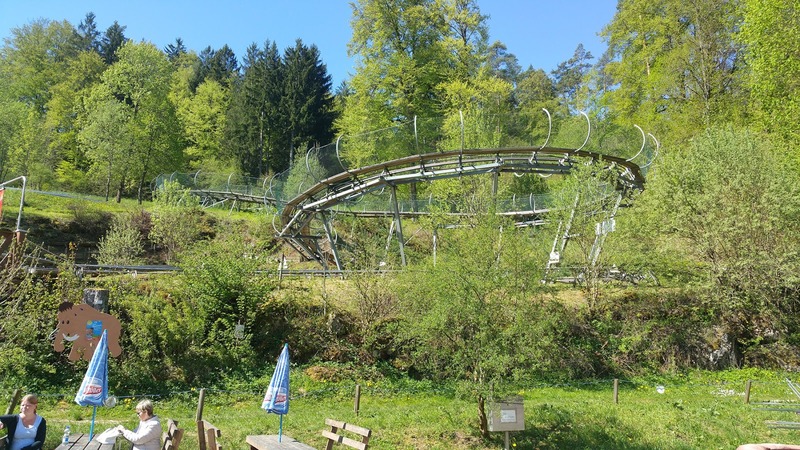 The Pottenstein alpine slide has two different types of tracks and we were excited to try them both. Kids of all ages lined up ready to slide down the mountain. And away we go! The first track we rode was the rail one, like a rollercoaster. Chris got a video of about a third of the run. We rode the rail version twice then rode the steel track twice and the kids loved it. Well, Fox LOVED it and Jane tolerated it. She's a good sport. After the slide we walked over to a free bouncy castle and let the kids have at it. Fox said, "I love this adventure!" I guess this is more up his alley than walking through churches and museums. "Mom take a picture of me in front of the cactus!" As you wish! 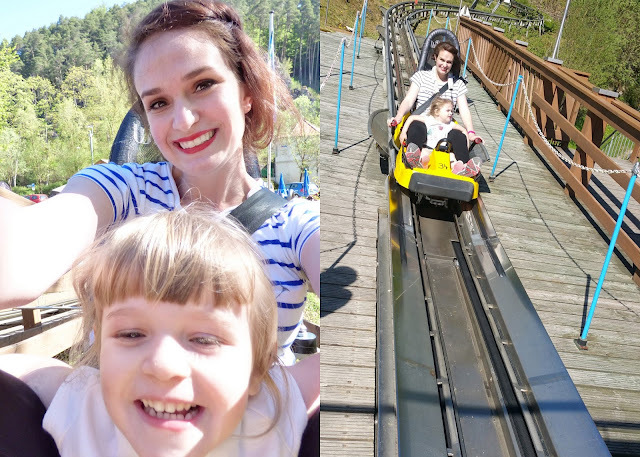 Alpine slide, bouncy castle, and ice cream? Best. day. ever. Their words, not mine! Then it was time to go explore the town of Pottenstein. High above the town is the 1,000 year old castle, or "burg". Looking down on the town from the road above. So charming. The town is nestled at the convergence of the Püttlach, Weihersbach, and Haselbrunn valleys. Darling half-timbered buildings and the Catholic church. Happy 9th anniversary to the love of my life! I love him more than commissary cookies, and that's saying something. A statue of Saint Elisabeth in the market square. Apparently Saint Elisabeth, the widow of Ludwig IV, was held hostage in this castle for a year back in 1228. According to legend, while she was being held, the food they gave her was transformed into beautiful roses. In some of these smaller towns it is hard to find a magnet, but luckily enough we found a good one! And the kids found themselves some little toys. Looking down the main drag and the market square. We love Germany. We never want to leave! Two fun-filled days in a row! How fun! And Happy Anniversary! LOVING all the photos!! The ride looks like it was a blast!!!!!!!!!!!!!!! Happy 9th! What a lovely way to celebrate. I wouldn't want to leave either. Happy anniversary, love! It was a super fun day!